After a long streak of great days, I guess it was time for a sore day. It’s nearly impossible to have a bad day though when it’s over 80 degrees outside! My elbow was quite tender this morning, it seemed like some fluid was building up on it. My right wrist has also been giving me some troubles today as well. However, while getting my oil changed at Walmart, I “accidentally” went on a shopping spree and bought more than I had intended. Shopping always makes a day much better! I’m still working out, though this week has been jammed pack full of things to do so I haven’t had a really good workout since Sunday. Sunday I went for a long walk at the park and actually jogged half a mile…which is good for me since I strongly dislike jogging. I am noticing subtle results, as it’s still to early too see much of a change in my stomach. I definitely feel tighter though, which is a huge plus. Below is artwork from two of my brother’s Ted and Doug. Ted designed this for the nephew of his friend who passed away in a tragic motorcycle accident. Jacob, the nephew, has cystic fibrosis and really looked up to his uncle. 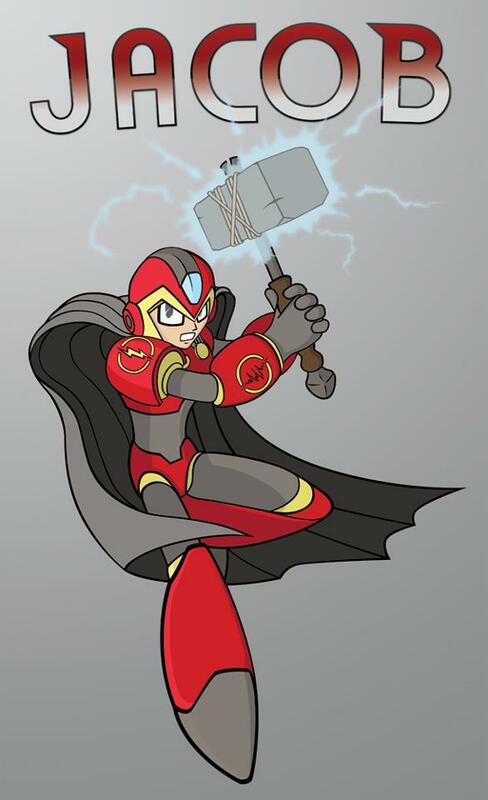 Jacob also really likes mega man, so my brother designed him his own character. Ted’s websites, http://disteldesign.com/ and http://distelphotography.com/. Doug, another older brother of mine is almost finished with the painting below. I posted another one of Doug’s paintings in my post https://beccadistel.wordpress.com/2012/02/14/talent-and-love-is-in-the-air/. Here is Doug’s site —> http://www.dougdistel.com/. Doug is looking for commission work, so feel free to contact him! I really enjoy featuring my family’s artwork because I am so proud of them, and what they can create!